A few nights ago I watched Silk Stockings, a musical set in Paris. It stars Fred Astaire as a movie maker and bon vivant, and Cyd Charisse as a Russian commissaire sent to Paris to bring home a famous Russian composer whom Astaire has hired to write the score for his new movie. The main subplot of the movie is how Charisse is transformed from a stern Communist who cares more about seeing Paris’s sewer system than Cartier to Astaire’s champagne-drinking, couture-wearing bride. In my favorite scene, Charisse is alone in her Parisian hotel room. She cancels a meeting, turns Lenin’s photo face down, hesitates, and then pulls out a pair of silk stockings she had hidden in a cabinet. She yanks off her Soviet woolen tights, wafts the silk stockings against her bare legs, then dances (so, so fabulously) through the room. She then lifts a cushion on the couch and draws out a chiffon slip. Next she dances to a table, reaches into an urn and in a smooth, quick motion produces a girdled belt. She is intoxicated with the idea of dressing herself in silky, forbidden lingerie. She feels beautiful, and you feel it with her. “Buy them!” I shouted. “I’ll pay you back!” A few hours later Liz came into the store with a bag full of her estate sale buys. She pulled out some Austrian cashmere sweaters, a pair of green stilettos (“Shoes of Consequence” the label inside said), some Italian cocktail rings, a couple of black cloche hats, and then there they were: a quarter ounce of Millot Crêpe de Chine extrait, a quarter ounce of Lanvin My Sin extrait, and a half-ounce bottle of My Sin bath oil, each still in its unopened, cellophaned box. At home, I opened the Crêpe de Chine and smelled a whole other world. The perfume was in perfect condition — not a given since it was discontinued forty years ago. I smelled a perfume-y waft of aldehydes and citrus, then a slightly powdery, spicy floral with a damp sandalwood, oakmoss, and animalic base. It was as if I’d walked through a rip in time’s fabric and come out on a busy boulevard in autumn in Paris in the 1950s. I dabbed more on my wrists and left for a dinner party. I felt sophisticated and beautiful. I knew just how Cyd Charisse felt in Silk Stockings. That night after the dinner party and a hot bath, I pulled a vintage chiffon nightgown out of an upper shelf in my bedroom closet where it had been for at least a year. I loved the nightgown, but it always seemed a little ridiculous — too frou frou — to actually wear. That night, though, I wore it to bed, the Crêpe de Chine faint but still lush on my skin. Postscript: Liz went back to the estate sale the next day when everything was half off and bought the rest of the perfume. So now, besides My Sin and Crêpe de Chine, I have a 150 ml bottle of Worth Je Reviens Eau de Cologne in a globe bottle with a glass stopper; a 100 ml bottle of Guerlain Mitsouko Eau de Cologne in a round, flat bottle; and a (sadly) dried out 1/6 ounce purse atomizer of Lanvin Arpège parfum that I plan to fill with new Arpège soon. Liz kept a four-ounce bottle of Dior Fraiche Eau de Cologne that smells like lemon, bergamot, and lavender. All of these bottles seem to be from the 1950s. If I could dance euphorically around my living room with any grace, I would. Cyd Charisse has nothing on me. wow, talk about a dream haul! I wish that sort of thing happened to me! Btw, isn't Silk Stockings meant to be the musical remake of Ninotchka with Garbo? Love that movie. Beautiful writing! And what a fortunate find, you lucky woman!!! I could see, smell and sense everything so clearly. With you all the way. Would love to have a sniff of that fab, perfectly intact CdeC. Next best thing: experiencing it this way, through you. Thanks from all of us. I am both happy for you and, I must confess, sooooo jealous! This is the kind of thing that I dream of happening to me! The Crepe de Chine sounds absolutely gorgeous…supposedly Long Lost Perfumes does a remake which is supposed to be true to the original, but I've never heard anything about how good it is. Great post, and enjoy your treasures! You are so very lucky and If you lived within 100 miles of LA I would ask just to sniff your wrist! You're so lucky to have a thoughtful friend who would call you and let you in on that find! Great story, all the ends neatly tied together, and a vicarious thrill. Now this is what I would call a profound perfume experience!! It definitely was a dream! I just want to sit and look at the bottles. Yes, it's the remake of Ninotchka. I tried to find Ninotchka to watch on Garbo's birthday last February (I think) but my video store didn't have it. I'll have to expand my search. It really was amazing–the perfume smelled so of another time. When I wore it, I felt like a different person, too. This is why I love perfume! I read on Bois de Jasmin that the remake of Crepe de Chine is pretty good, which makes me happy since I'm now hooked. It really was a dream come true for me, and I've had rough times lately so I feel like this is fate's way of paying me back in spades. If you were here, I'd annoint you with the CdC and you could sniff your own wrists! I am so grateful to her, and to her marvelous taste–at least half my wardrobe has come from her store. I'm so happy for you, A! I always love your writing, and today both your awareness of the signifigance of your haul and your utter glee shine through at the same time :). 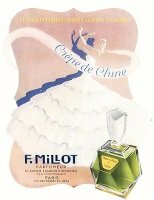 Crepe de Chine was my grandmother's perfume. I received a sample of it in a swap recently and caught a whiff of a memory in smelling the remake, but nowhere near as profound as the original. There are lots of estate sales & auctions here in the rural midwest, and I go to as many as I can. On several occasions, I've been able to purchase boxes of vintage scarves, handkerchiefs, gloves….one of these days, maybe I'll find perfume! I'm not surprised that the glee leaked through…I hope you find some great perfume in your estate sale outings, although vintage scarves and gloves are pretty terrific, too. There are few things I like better than going to estate sales. Yessssss!!!! You lucky gal, you. How is the My Sin? I have some EdP (I think) and it's pretty fab… I bet the extrait is killer, though. Thanks to Erin, I had a sample of the EdP, but it reminded me enough of Narcisse Noir that I didn't feel like I had to hunt down a bottle. The extrait, though, is another story. I love it. It has that great interplay of white flowers and dirty animalic drydown that narcisse noir does, but something clean in it–maybe the ylang ylang?–makes it wearable during the day, too. Wow! I just love those moments… even if it's only in a story or in someone else's life. Congratulations! and what a nice story spun around. My mom had a bottle of Crepe de Chine. I scarfed it from her for my first “real” dance. That was mid-60s, and I felt so grown up wearing it! What a wonderful piece of writing. May you find many more surprises! Thank you! I can't get over my luck and I can't get over how much I love those old fragrances. Have you smelled CdC recently? I bet it would bring back a lot of memories. And I wish you wonderful surprises, too! Make sure you tell me about them. Wow! Congrats Angela, what an amazing find – enjoy (I am green with envy that you have access to all that great vintage stuff through your friend!). Perfume is a bit like a time machine. When my grandmother passed away, I got an old jewelry box of hers. Tucked away in one of the drawers was a tiny cardboard tube that contained glass perfume ampoules – probably dating from the fifties. I briefly got to sample “Evening in Paris”, and “My Sin” – what fun! Wonderful writing, wonderful finds, I felt the excitement coursing through me! I love your review and I think you are amazing the way you entirely 'live your perfumes'. Also I like how you can match a perfume with a person like you do in your vintage store, just like a fashion designer changes peoples clothes in his or her mind while watching them walking on the street e.g. C, I love it that your grandmother valued the ampoules of scent so much that she tucked them away with her jewelry. People think about music and fasion as echoing time, but perfume definitely does it, too. Thank you! I do love the dimension of scent (and you probably do, too, or you wouldn't be reading NST!). I wish I were better at picking out notes in a scent, but one way I can explore a scent is to think about its character, who it might suit and why. You and Robin and Kevin are THE reason I log on to this site several time a DAY!!!!!!! Your writing, of course, your passion, your intelligence, your imagination and creativity — all make fragrances come alive for me. Thank you; we are indebted. Gosh R, thanks! I have to say that your enthusiasm is pretty inspiring, too!